A night without electricity means no hot water in the morning, so we started out early with a minimum of delay, although a second barge did its best to hamper us, having arrived alongside ready for a turn in the popular dry-dock, leaving us only a scant boat's width to exit the mooring. Our passage for the day would take us 50km up the Canal du Nord, joining the section shared with the Canal de la Somme as far as Péronne. From what we could see there were no other suitable mooring places prior to this - the banks of the canal, completed only in the 1960's, are mostly of sloping concrete, so are highly unsuitable for an overnight stop. Combined with the heavy wash from the frequent barge traffic, stopping en route would be less than desirable. 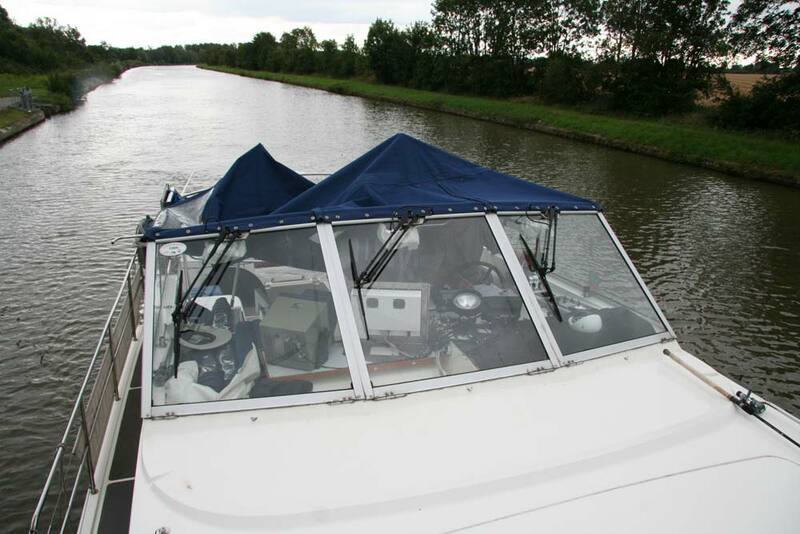 We made good progress along the wide canal, with only the large locks causing us some delays. 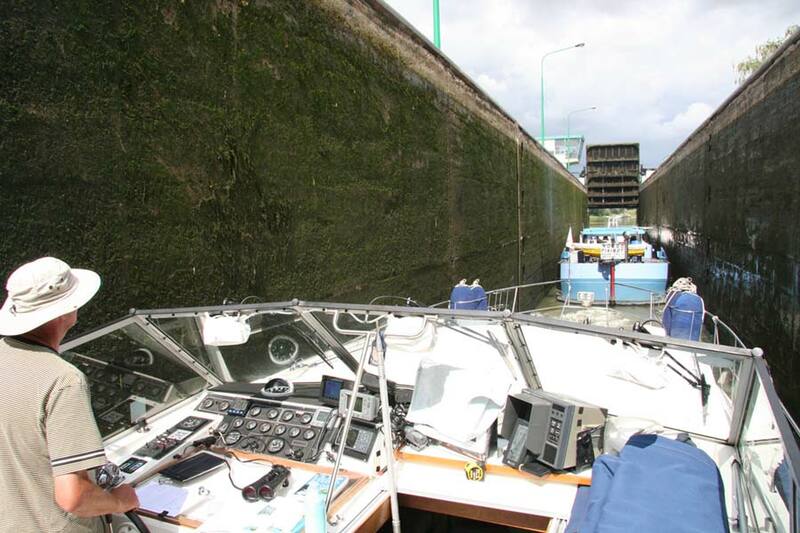 Even if there were no other boats waiting, the size of the lock chambers made for a notable wait if the lock had to be emptied or filled for our passage. As lunchtime approached the clouds thickened and we made the practical decision to stop off at a lock waiting quay for a lunch break, which allowed the first of a series of showers to pass overhead. After this the afternoon deteriorated into a steady drizzle and we had to fashion a temporary tent out of our canopy and assorted boathooks in order to continue on our way without getting totally soaked. The port de plaisance at Peronne is a combined affair with a popular 3* camping and caravan site and the highly recommended facilities include on-site 'friterie', bread-ordering, games area and swimming pool as well as the regular household necessities. The site is somewhat distant to the centre of Peronne, further hampered during our visit by the complete replacement of the only road bridge and a contraflow system causing long queues. An important goal in the Battle of the Somme, Péronne is at the centre of the circuit of remembrance, and its Historial de la Grand Guerre, housed in the Chateau du Péronne is a contemporary juxtaposition of life on the home front and in the trenches. 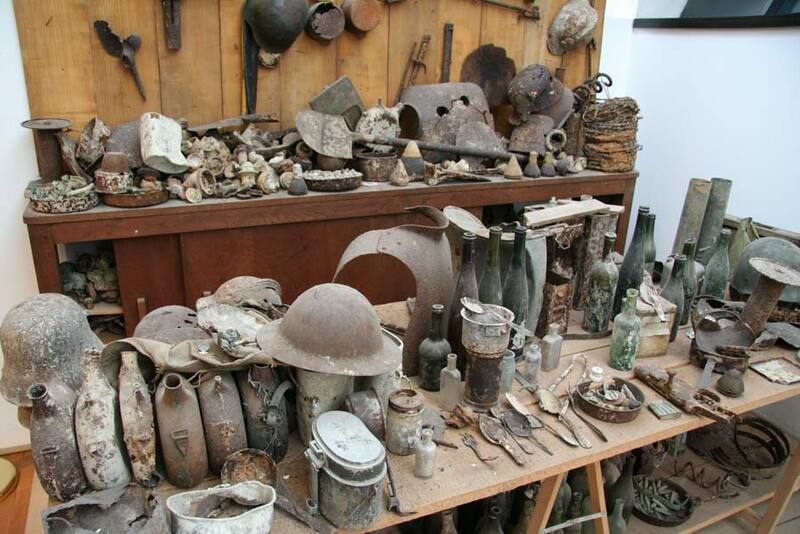 Starting with the events leading up to 1914, and an explanation of why it became a 'world' war, the unusual displays include a collection of architects' models of proposed war memorials, and a reconstruction of the Yves Gibeau 'museum', housed in his attic in Roucy, near to the Chemin du Dames.